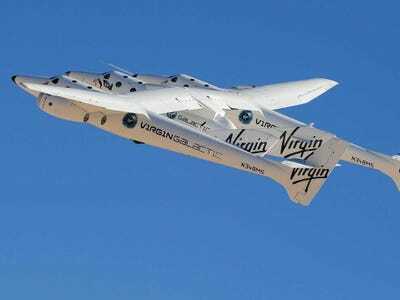 Virgin Galactic came forward publicly today with a revealing statement into the NTSB investigation on the crashed SpaceShipTwo. Most interesting is its detailing of the moment before the crash happened. It highlights what appears to be a failure that could have led to the crash, though it notes the investigation is still ongoing and we don’t know for sure yet what happened. In plain terms, and according to the NTSB investigation, the company says that the lock/unlock lever was pulled prematurely based on how fast the craft was going. That, basically, led to a deployment of the mechanism used for re-entry. When that happens, the wings separate from the vehicle mid-flight. The NTSB also evaluated the vehicle’s feathering mechanism, which is the unique technology that turns the wing booms into position for re-entry. The NTSB indicated that the lock/unlock lever was pulled prematurely based on recorded speed at the time, and they have suggested that subsequent aerodynamic forces then deployed the feathering mechanism, which resulted in the in-flight separation of the wings and vehicle. At this time, the NTSB investigation is still ongoing and no cause has yet been determined — these are purely facts based on initial findings. We are all determined to understand the cause of the accident and to learn all we can. 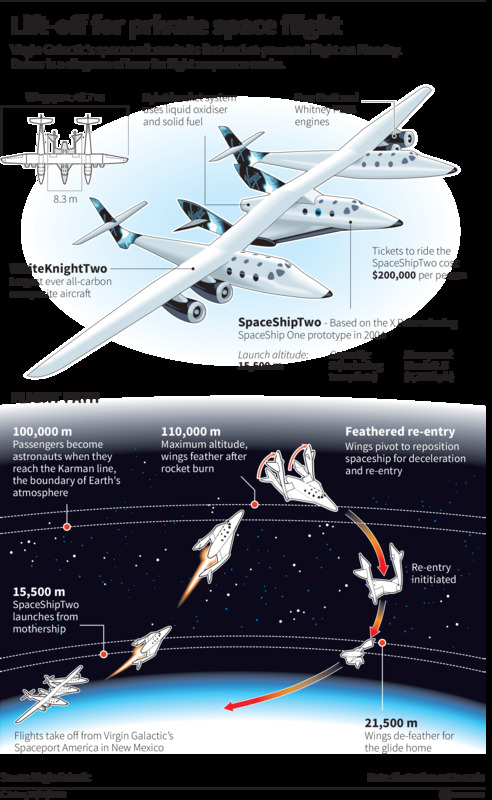 The company also notes that it is still building the second iteration of the SpaceShipTwo, in fact it’s 65% done. Over the past several days, we have received new information about the tragic incident that resulted in the death of Scaled Composites’ co-pilot Michael Alsbury and injuries to pilot Peter Siebold. Our thoughts and prayers remain with the families and friends of these brave men. The following summarizes what has been learned from the formal investigation. On October 31, 2014, SpaceShipTwo conducted a powered test flight and experienced a serious anomaly that resulted in vehicle failure. The National Transportation Safety Board (NTSB) is in charge of the investigation and we are cooperating fully with their work. While we cannot speculate on the causes of the incident, the NTSB has provided important information about the facts surrounding this case and in their final onsite press conference they described a timeline of events based on the telemetry data in their possession. The investigation will now continue offsite. Based on information they have released about their investigation to date, the NTSB has recovered the intact engine and rocket propulsion fuel tanks with no signs of burn through or mid-air explosion. This definitively dismisses the premature and inaccurate speculation that the problem was related to the engine or the fuel. At Virgin Galactic, safety is our guiding principle and the North Star for all programmatic decisions. Our culture is one of prioritizing safety as the most important factor in every element of our work, and any suggestions to the contrary are untrue. We are committed to learning from this incident and ensuring something like this can never happen again. To that end, we will work closely with the NTSB and will focus intense effort on its findings and guidance. For Virgin Galactic, everything rests on our vision of creating accessible and democratized space that will benefit humanity in countless ways for generations to come. Like early air or sea technologies, the development is not easy and comes with great risks, but our team of more than 400 dedicated engineers and technicians are committed to realising the potential of this endeavour. From research, to travel, to innovation, we believe that the technology our industry is pioneering is crucial to the advancement of humanity. Over the last few days, we have been so grateful for the outpouring of support and inspiration shared by countless Future Astronauts (customers), members of the space community and the public at large. Testing programs, reaching back to early aviation, have distinct risks, and our customers know that we will not move ahead with commercialized space travel until our expert engineers and pilots deem the program to be safe. These are among the brightest and most experienced professionals in the industry and our success has and will continue to be ensured by their expertise. While this has been a tragic setback, we are moving forward and will do so deliberately and with determination. We are continuing to build the second SpaceShipTwo (serial number two), which is currently about 65% complete and we will continue to advance our mission over the coming weeks and months. With the guidance of the NTSB and the assurance of a safe path forward, we intend to move ahead with our testing program and have not lost sight of our mission to make space accessible for all. We owe it to all of those who have risked and given so much to stay the course and deliver on the promise of creating the first commercial spaceline.